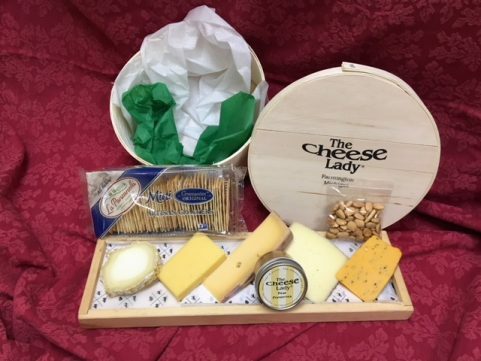 Gifts from The Cheese Lady are the perfect complement to any gathering. We have some great ideas! Let us customize something especially for you or choose from the popular choices below. Call the store to order today 248 957 9581. Gift cards now available, click here to order. Includes: 1/4 lb. each of Irish Cheddar, Prima Donna, and Young Manchego with Cheese Lady Pear Jam and Panzanella crackers. Packed in a bag with holiday tissue and ribbon. Includes everything in our $25 Gift Bag, plus Cinnful Crunch. Includes everything in our $25 Gift Bag, plus Cinnful Crunch and Marcona almonds. Includes: 1/4 lb. each of Irish Cheddar, Prima Donna, Young Manchego, Bucherolle, and Cotswald, plus Cheese Lady Jam, Marcona Almonds and Panzenella crackers. Packed in a wooden hatbox and wrapped in cellophane, tied with ribbon. 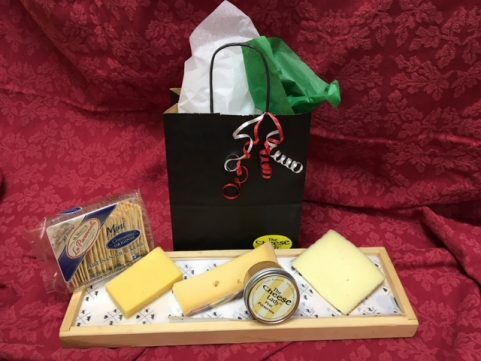 Includes everything in $50 Gift Box but all cheeses are cut to 1/3 lb instead of 1/4 lb, plus a bottle of Donna Portuguese red wine. Includes everything in $70 Gift Box plus Cinnful Crunch. Remember to order early. Use simple packaging or add baskets, wooden boxes or platters. Add beverages, wine or juice. Add additional cheeses or spreads. Add your own homemade items (pickles, Christmas decorations, cookies, etc.). We are pleased to make your gift extra-special for you! *Quantities of each cheese will vary slightly as they are cut directly from the wheel or block to order.